A parabolic sensor for use with ultrasonic leak detection instruments allows accurate, remote and highly directional detection capabilities. Detecting errors before they occur – that’s the objective of preventive maintenance. The Hannover Messe will be addressing the topic of “Predictive Maintenance” with a dedicated exhibition area, where SONOTEC will be demonstrating how companies can save energy and improve the efficiency of the entire production cycle using Sonaphone technology. From April 23 to 27, 2018, the ultrasound specialist will be presenting the new broadband parabolic sensor BS30 for the Sonaphone digital ultrasonic testing device for the very first time, as part of the special exhibition in Hall 22. The parabolic sensor BS30 for the Sonaphone ultrasonic testing device can be used to detect leaks in compressed air, gas and vacuum systems as well as partial discharges over distances of up to 25 meters. The airborne sound sensor has been specially developed for the digital testing device. In addition to its range, the broadband sensor is also characterised by its directionality and its immunity to interference noise in the audible range. This allows for easy leak detection even in loud and challenging industrial environments. “Whereas comparable testing technology only allows for processing over a narrow frequency range, our sensors make it possible to carry out a completely new analysis of the ultrasound signal in the frequency range from 20 to 100 kHz”, explains Hans-Joachim Münch, Managing Director of SONOTEC Ultraschallsensorik Halle GmbH, talking about the special features of the Sonaphone sensors. In addition to the BS30, the ultrasound specialist also offers an airborne sound sensor and a structure-borne sound and temperature sensor for the Sonaphone. Depending on the sensor, the multi-functional ultrasonic testing device can be used to detect and evaluate leaks and therefore reduce energy costs, to detect partial discharges and increase operational reliability, to detect potential weak points on bearings in good time in order to prevent any unplanned downtimes, and to assess the functioning of steam traps. “The key benefit of our Sonaphone can be summed up in one key word: efficiency. Often, preventing just a single downtime is enough to make up for the investment costs for the device”, says Hans-Joachim Münch. Visitors to the Hannover Messe can see the benefits of different versions of the Sonaphone technology for themselves: As well as the Sonaphone E for potentially explosive areas, SONOTEC also offers a compact testing device for preventive maintenance in the form of the Sonaphone Pocket. 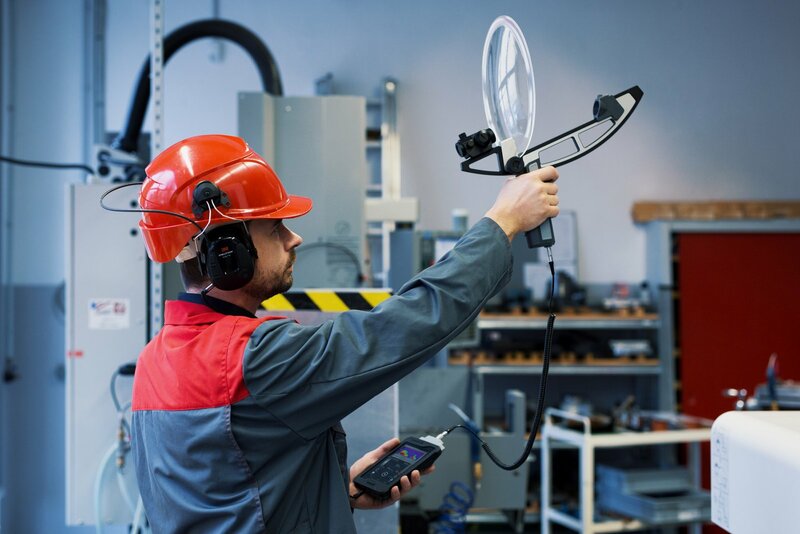 The smallest testing device in the Sonaphone family is a hit with users thanks to its intuitive operation and is used primarily for leak detection on compressed air, gas and vacuum systems.